Two points to note. 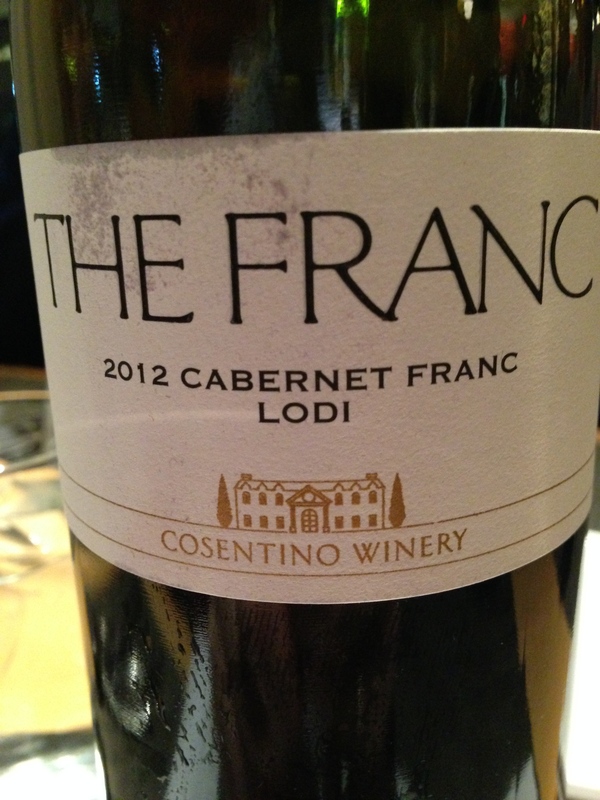 I love Cabernet Franc, and I am a fan of Cosentino wines having visited their tasting room in Napa back in June with Moxie. I saw this wine on the list at a nearby Cajun-Korean Fusion restaurant. With no hesitation, the wine was ordered and poured into some rather nice BAG’s (Big Assed Glasses). This wine is from Lodi fruit and was slightly atypical. I almost sensed a Zinfandel component. The red fruits and berry flavors gave way to some plum jam and earth with a peppery spice finishing it off. The wine itself had good acidity and the tannins were smooth. The flavors of the package were very delightful. I was expecting the softer more perfumed style of Franc but was happy to have experienced a different terroir and style for this varietal. It is listed at $22 on the winery’s website and I reckon it delivers the goods. 90 points and 4 stars from me. Salut….